Chief archivist Galina Baranova, and archives director Virginia Čijunskienė spoke to our group. 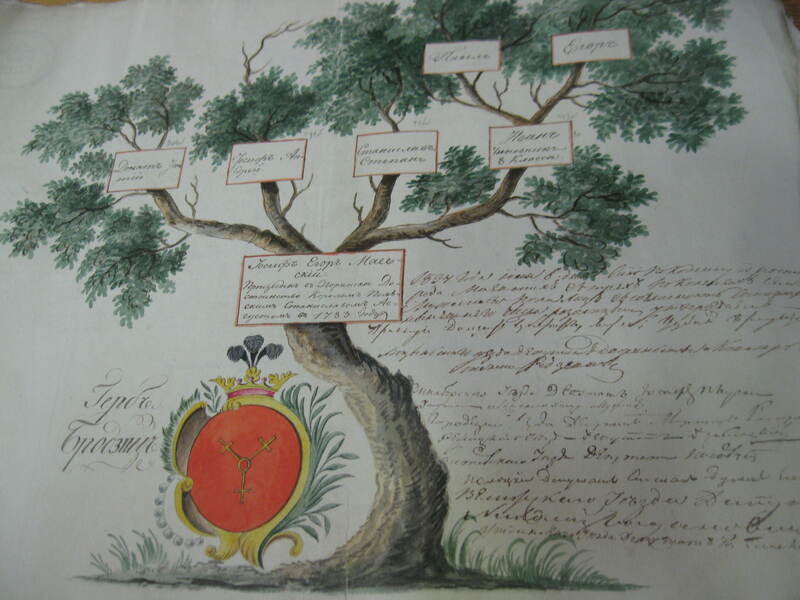 The Vilnius State Historical Archives were established in 1852; the oldest records date from the Grand Duchy of Lithuania in the 14th century. 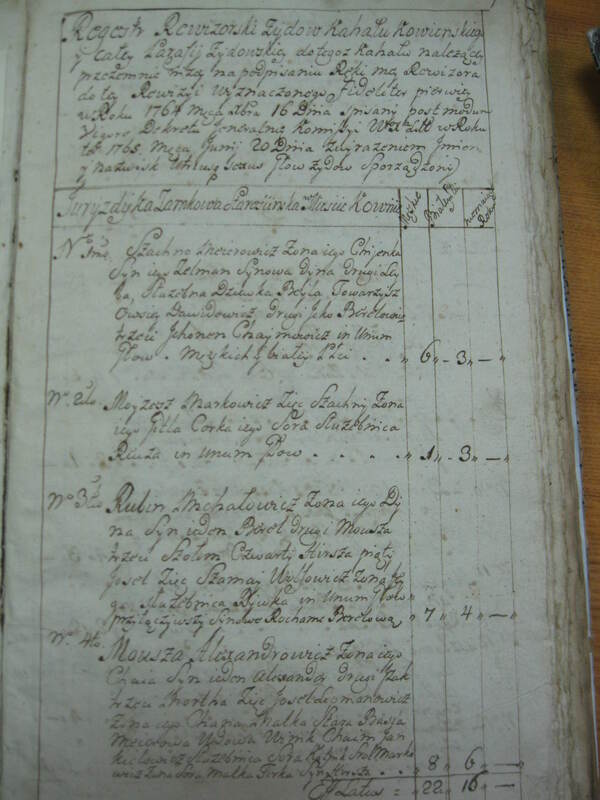 There are 1 ½ million documents and the process is just beginning to digitalize records. It will be a very long process since government funding is extremely limited. 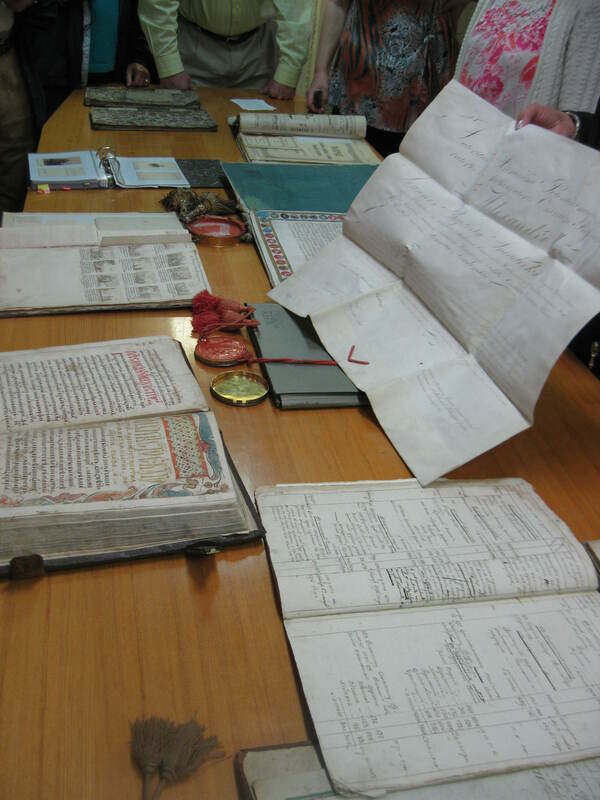 Displayed were some old historical documents, including a Kovno Jewish Revision List from the 18th century. For Jewish genealogy research, the civil institution records (vital records) are typically more useful than Revision List records. Genealogy Geekspeak: In 1918, upon Lithuania’s independence from the German Empire, all Jewish names were converted to Lithuanian style, in the Lithuanian language only, not in Yiddish. Jewish vital records were kept by synagogues (birth, marriage, death), and families would later bring them to the civil administration. Languages recorded were Yiddish and Lithuanian. Unfortunately, many documents were destroyed during WWII and records from entire shtetls may be missing. Jewish schools records from the 19th century should be in Vilnius, but the Volozhin Yeshiva records may be in Belarus. For people searching family roots in this part of Eastern Europe, locating records can be difficult. Ruled by a succession of countries over the past centuries, record locations will vary depending on the time period. 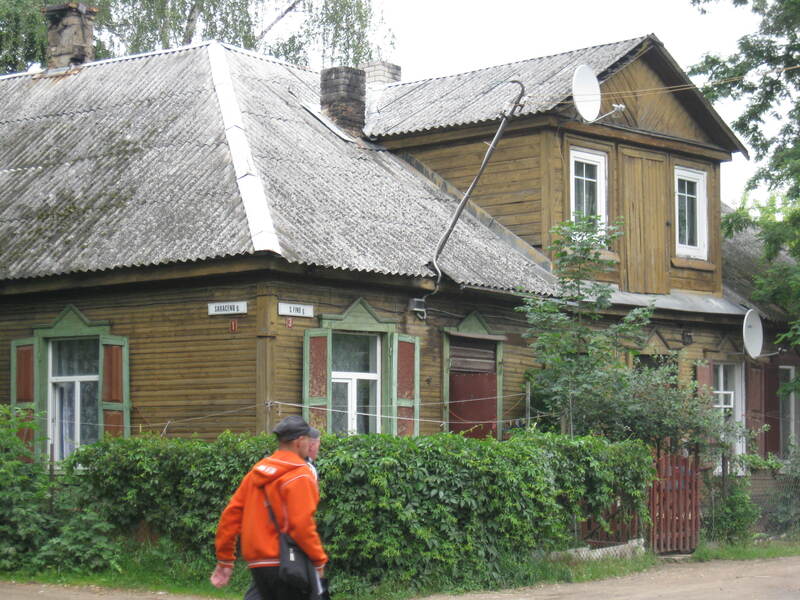 For example, my family records prior to the late 19th century are located in Vilnius; Galina was able to retrieve records of some likely Ruderman ancestors from Dolginovo (Dalhinev). More recent records are located in the Minsk Archives in Belarus, due to the region being part of the Russian Empire, and later, the Soviet Union. A separate issue for Jewish records: with the destruction of so many shtetls and much of the Jewish community, there is no guarantee that any records have survived. I will be investigating the Minsk Archives for records from the late 19th century, and do not yet know if any records will be found. We visit a Jewish owned café that serves lunch to elderly each day in a separate dining room of the restaurant. 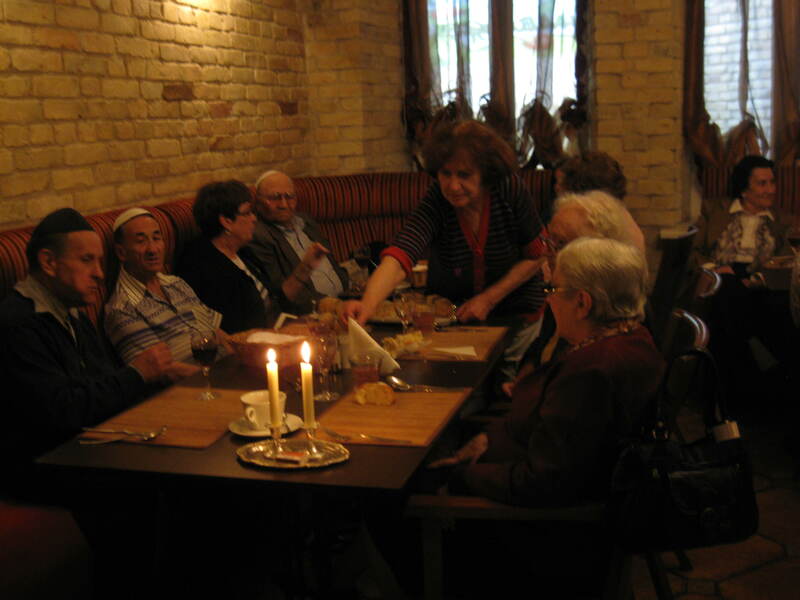 Arrival was during Friday Shabbat lunch, when the the elderly were served challah and wine in addition to their meal. In small groups we visited and brought gifts to people being helped by the Jewish community center: an elderly person and a family. My group first visited a woman who lives in a 2-room apartment with her eight-year-old child, an older sibling and mother-in-law. Her husband is out of work and travels long distances for odd construction jobs. An adult child is working in Ireland and sends home some money, including money for a computer for the 6-year-old girl. Their two-room government-owned apartment is in a 400-year-old former monastery building that became horse stables in the 19th century. They receive help for food, school supplies, clothing, firewood for heating their home and some home repairs. We also visited 85-year-old Michael Sverdlov, who was born and grew up in Glubokoe, was drafted into the Soviet army in 1944 and returned to Belorussia in 1951. In 1957 his family was not allowed to go to Israel, and they moved to Vilnius. 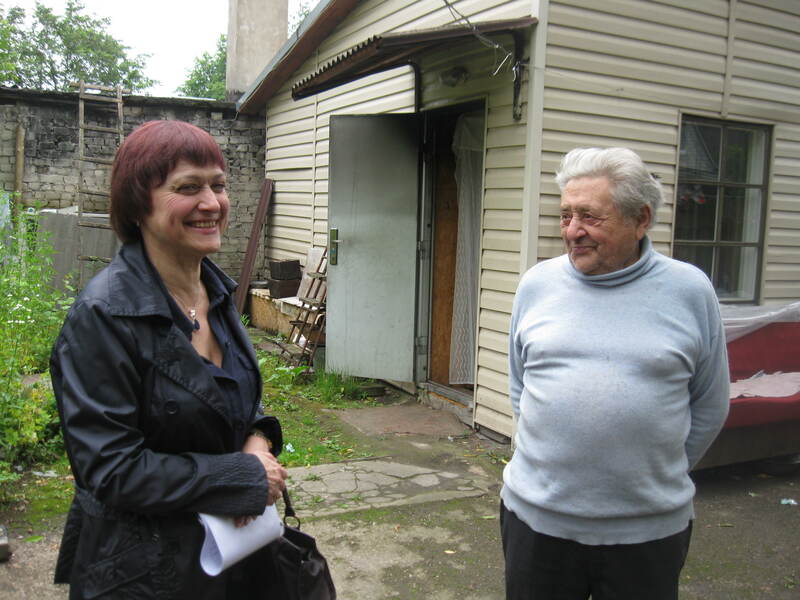 The Jewish center has helped him with house repairs, wood for heating and a debit card for food. 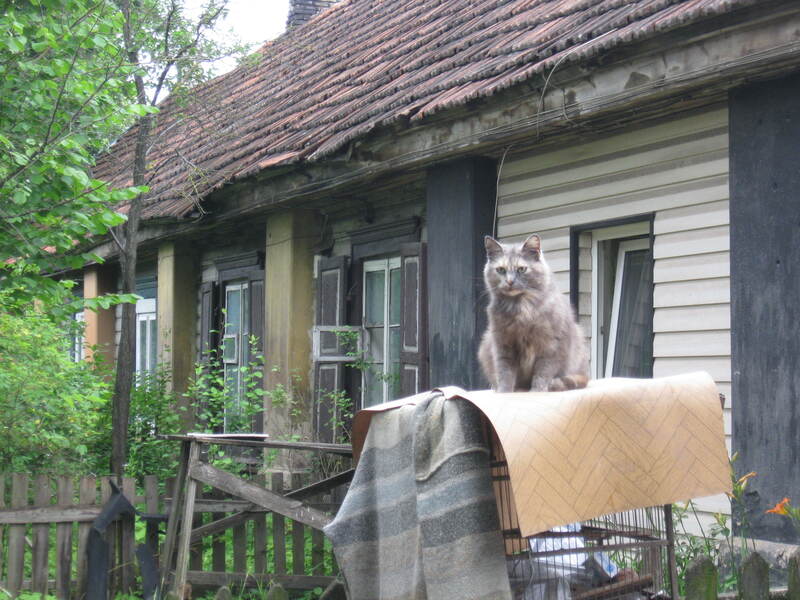 Michael’s government-owned home has no utilities and is in a neighborhood of pre-communist homes, all made from wood. He’s lived there for 60 years. Michael recognized the Ruderman family name from Glubokoe, but not Abelson. Our group brought food and toiletries for the people we visited, and some treats for the 8-year-old girl. 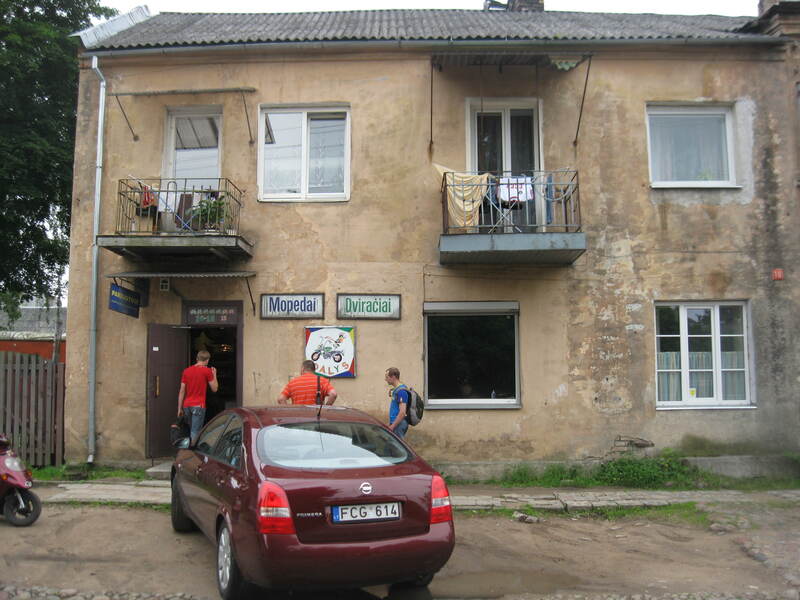 The last stop was the Jewish kindergarten, which is highly regarded in the city and has a long waiting list, oddly enough including non-Jewish Lithuanian children. 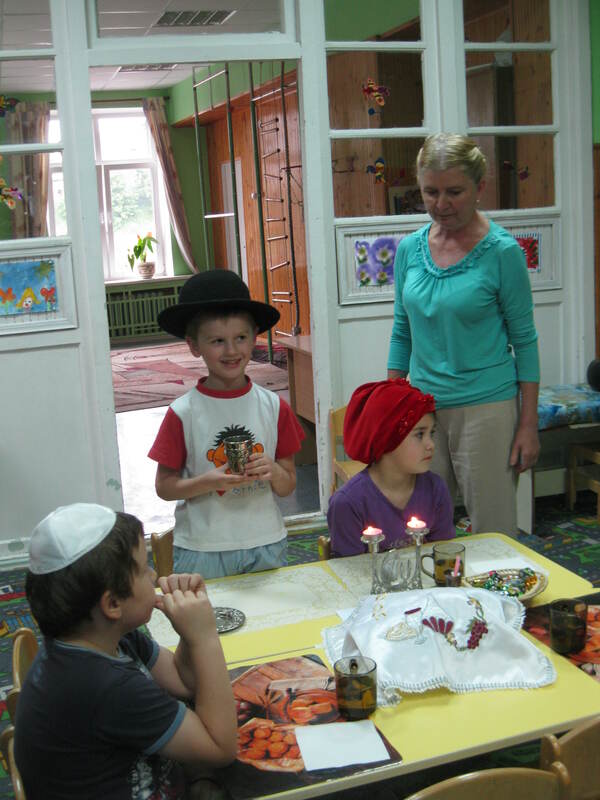 The children were preparing a Shabbat ceremony with an adorable black-hat Abba and an Ima. They sang a couple of songs, “Shalom Aleichem” and “Hinai Ma-tovu” – and were happy (and surprised) to see us singing along with them. In class, the children speak Lithuanian, Russian and Hebrew. 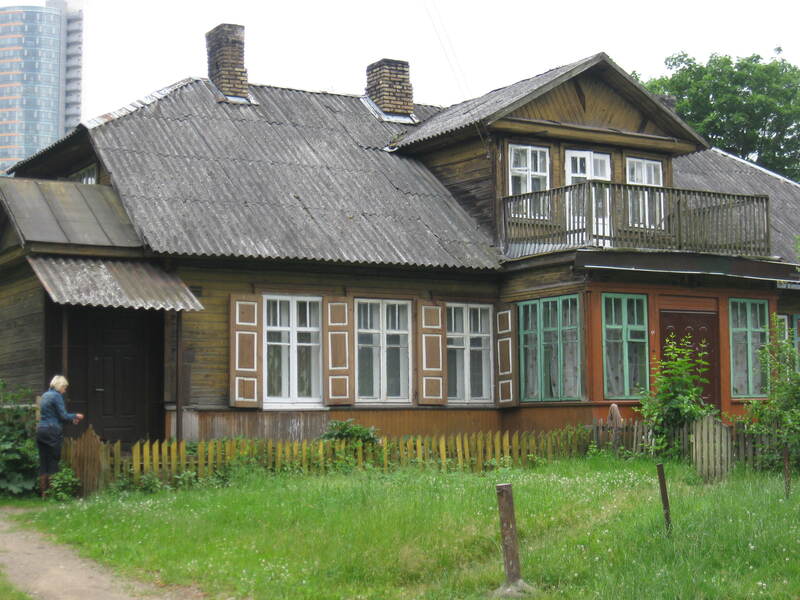 This entry was posted in Uncategorized and tagged Kovno Revision List, pre-Soviet neighborhood, State Historical Archives, Vilnius. Bookmark the permalink.